For the first time, TCC students joined the CIVIC Scholars Program along with a cohort of students from Old Dominion University. Griffin Leach and Justin Pimentel were selected because of their academic achievements and community engagement. CIVIC Scholars was created by the CIVIC Leadership Institute and Old Dominion University in 2013. Currently, 22 students participate in the program. The goal is to foster a spirit of civic engagement, professionalism and service leadership to create a network of issue-conscious leaders. “We’re thrilled to provide our students with the opportunity to make connections with other students and senior-level professionals in our region,” said Norfolk Campus Provost Jeffery Boyd. Boyd and Rhine are both graduates of the CIVIC Leadership Institute. Griffin Leach came to Hampton Roads to play hockey for the Hampton Roads Whalers. He changed course when he found a passion for learning. “Playing for the NHL was always my dream. But when doors started closing, I had to get a new dream,” he said. Leach holds a 4.0 GPA and is working toward his Associate of Science in Business Administration. He plans to transfer to the University of Virginia to study at the McIntire School of Commerce. He plans a career in actuarial science or finance management. Active on and off campus, Leach serves as treasurer of Student Government Association and volunteers in the accounting department for Chesapeake Regional Medical Center. He also mentors a child with Big Brothers Big Sisters of America, and does community service projects with TCC Cares. 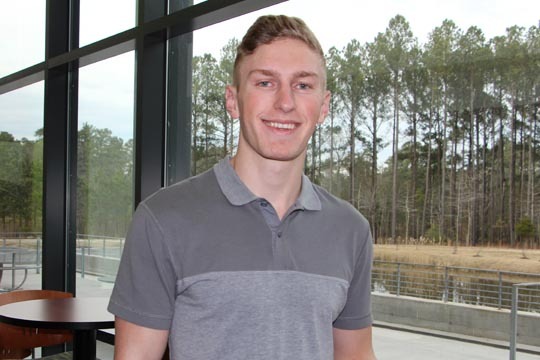 A 2015 graduate of Indian River High, Justin Pimentel chose TCC because he wanted to be smart financially. “I was unsure of my major and knew that community college would be the place to explore options,” he said. Pimentel started studying at Norfolk Campus, serving as president of the student ambassadors. He also takes classes at the Virginia Beach Campus and serves as a senator for Student Government Association. Pimentel works part-time as an optician technician. Pimentel recently selected the Associate of Science in Computer Science degree and hopes to transfer to George Mason University. His dream job is to be an information technology engineer for the CIA or FBI. Pimentel credits the CIVIC Leadership program for helping him develop skills and network contacts that will be an ideal foundation for his career. “I hope the college will keep this going. The program is great for students who are reliable, hard working and motivated to do whatever is asked,” he said.